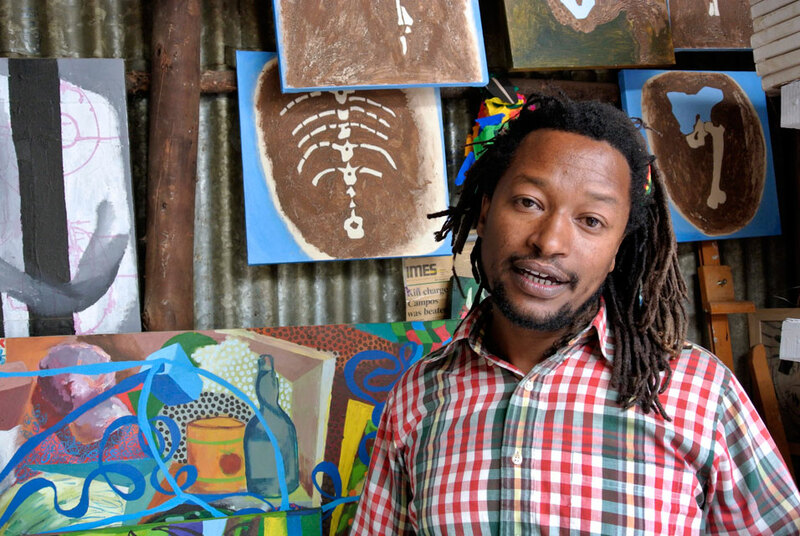 Contemporary Ethiopian artist Tamrat Gazahegn shows off one of his paintings at the Netsa Art Village in Addis Ababa, Ethiopia, on February 22, 2013. Tamrat is part of a collective of Ethiopian artists spearheading the contemporary arts scene in Ethiopia, which features experimental material, multimedia and unexpected aesthetics to create avant-garde art. Still in its infancy, contemporary arts recently got a boost at the opening of Ethiopia's first international art exhibition, where The works of Ethiopian contemporary artists were displayed alongside world-renowned artists such as Brazil's Oscar Niemeyer. Despite recent growth, experts say contemporary arts lack sufficient scholarship and criticism, and still have a long way to go before Ethiopian fine arts will be an internationally-recognized genre and allow artists to make a decent living. AFP PHOTO/JENNY VAUGHAN. ADDIS ABABA (AFP).- Under a canopy of trees in a park not far from Addis Ababa's National Museum, home of many of Ethiopia's historic national treasures, a contemporary art revolution is quietly afoot. It is here at Netsa Art Village that the experimental work made from shoelaces by Merhet Debebe can be found, or the vibrantly-coloured work of Tamrat Gazahegn, who uses tree trunks as canvases. Nearby are the giant sculptures of jazz musicians, trains and horse-drawn carts made from metal scraps and trash by Tesfahun Kibru. The collective, the only one of its kind in Ethiopia, is made up of 15 artists who are spearheading Ethiopia's contemporary art movement, shifting away from endless copies of Ethiopia's ancient Coptic Christian paintings. Still in its infancy, the movement marks a daring shift away from the commercial art that dominates many of Ethiopia's mainstream galleries, and seeks to put the country on the map in the international art world as a source for cutting edge work. "We're trying to say that Ethiopia is not just a place for cultural and historic and prehistoric treasures, but contemporary work too," said Desta Meghoo, an art curator living in Ethiopia. "We don't want to continue to be a footnote in art." Ethiopia held its first international art exhibition earlier this month. The show, at the capital's National Museum, co-curated by Meghoo, displayed the work of young, relatively unknown Ethiopian painters next to the works of famed international artists, including Brazil's Oscar Niemeyer and Portugal's Paula Rego. For Ethiopian painter Merid Tafesse, who had two pieces in the show, the exhibition is an opportunity to tell the world that there is more to Ethiopian art than the kitsch sold to tourists. "This is good not just for me as an artist" said the dread-locked artist, smoking a cigarette. "Most Ethiopians cannot see where Ethiopia is in the fine arts industry, so this will give good exposure," he added. He said most buyers look for cliches in Ethiopian art -- wide-eyed cherubs, traditional crosses, worshippers in white mantles -- but he and his contemporaries are producing work outside that box, even if it means suffering commercially. "It is easier for most people to connect with the commercial art because they see some motif of the church, or some cultural clothes, so they think that represents Ethiopia better. But the personal expression... of an artist is what makes it art nowadays," he said. Some artists, namely Tamrat, are using themes found in traditional Ethiopian art, but in experimental ways. He paints scripture on traditional-looking scrolls, for example, but the words are his, not lifted from the Bible, and the scrolls are painted in vibrant greens, yellows and oranges, not a common palette in traditional art. As striking as the work is, Mehret said most artists struggle to make a living. Though the collective provides a space for artists to produce their work, it does not guarantee sales. Merhet, one of the collective's founders, hopes to see a time where "the artist is free of struggling to survive." "I am hoping to get that opportunity for the artists here. At this pace, I don't know that it will come soon, but I hope, I hope," she said, laughing off the notion that she can earn a living from her performance pieces in which she uses shoelaces. "Commercially I cannot say it has been successful selling the art works," she said. Today's contemporary art movement is an outgrowth of Ethiopian modernism, which emerged in the 1950s and 1960s to much international acclaim. Modernism went quiet in the 1970s, with the takeover by the repressive Communist junta, called the Derg. Creativity was stunted and many artists fled, while those who stayed were permitted only to produce socialist-inspired revolutionary work. Today, experimental creativity is reemerging, which Ethiopian art scholar Elizabeth Woldegiorgis attributes to greater access to the outside world through the internet and the Addis Ababa School of Fine Arts, the only establishment of its kind in Ethiopia. Elizabeth, who also runs the country's only modern art gallery, said the absence of scholarship and critical analysis in the country is stunting contemporary art, making it difficult for artists to gain international acclaim and sell their work on the international market. "An internationally-acclaimed artist has not been produced in Ethiopia," she said. To date, there have been no major sales by Ethiopian artists abroad, save for Ethiopian-born, American-raised artist Julie Merhetu who was commissioned by Goldman Sachs to create a mural in their New York offices for $5 million (3.8 million euros). Locally, works sell for much less: typically the work of Tamrat and Merid fetch $1,500 (1,150 euros) to $3,000 (2,301 euros), paltry sums by comparison. But Meghoo remains optimistic, believing it is only a mater of time before Ethiopian work will be featured in the contemporary section of international galleries such as New York's Museum of Modern Art (MoMA). "Merid's work is in the MoMA's archives, mind you, it's not been on the walls yet, but the MoMA also declined Basquiat's work," she said, with a smile, referring to the acclaimed late New York-born graffiti pioneer Jean-Michel Basquiat.